I’m the author of five books, including my very first e-book 50 Ways to ACT Like A Pro that you can download for free here! In my e-book you will find fresh ideas, solutions and helpful tips to help you ACT like a pro today! I’ve also written three other business books, all optioned by publishers. Check out the author’s page to learn more. And, because I believe in following your dreams (and I encourage my clients to do so, too), I’m finally a novelist with two self-published titles to my credit. 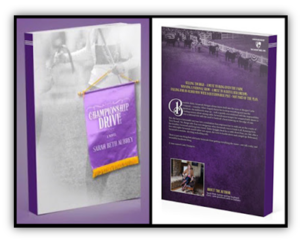 If you’re up for a light read in the cowboy romance genre, enjoy my Championship Drive series here. My mission is simple: I’m here to help individuals and organizations facilitate progress and navigate change. Along with that, my signature theme has become ACT like a pro, which is about stepping into your best self or building your team to be an efficient, productive organization. 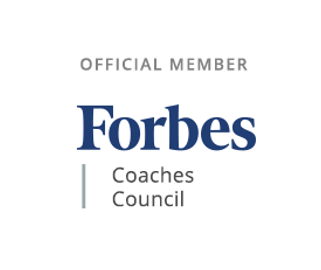 I employ a variety of tools including professional assessments like Strengths Finder ™, I design and deliver training curriculum or workshops in several key areas of organizational leadership, and I work with individual executives as a business coach. One of my specialties is my Your Strategic Plan on a Page in 1 Hour or Less workshop. 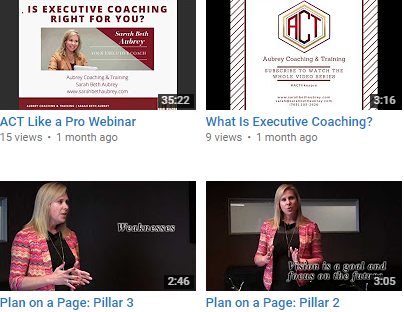 Hop over to either the Speaking or the Coaching pages now if you’d like to learn more. I should tell you up front that my home industry is agriculture and rural development. Of course, I’m happy to work in other areas if the opportunity is right! I strive to enhance success and profitability for my clients by building capacity in people. Everyone’s definition of success is unique, so likewise, I work in several ways to help clients achieve results including with one-on-one executive coaching, by facilitating peer groups, or by leading boards through change-based planning initiatives. 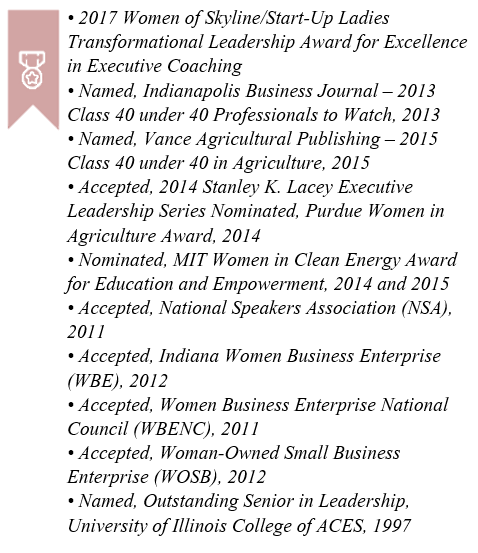 In May 2017, I was delighted to be recognized for my work by the Indianapolis Start-Up Ladies/Women of Skyline Club by being presented the Transformative Leadership Award for Excellence in Executive Coaching. 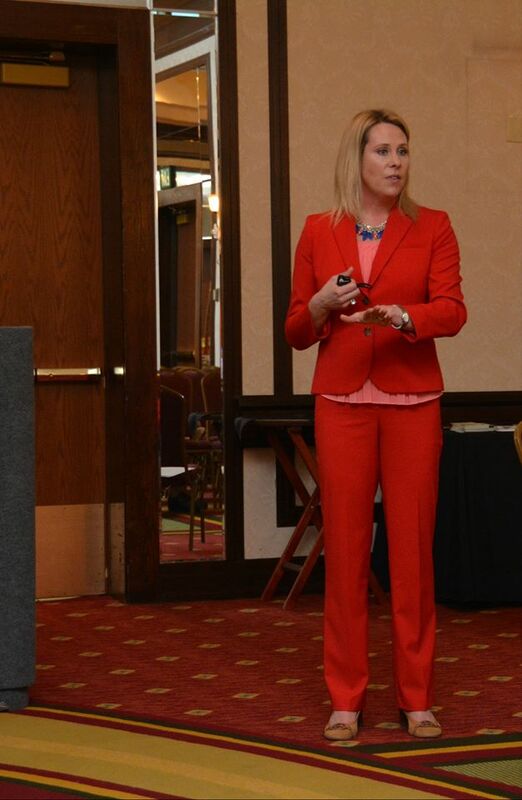 As a speaker and workshop leader, I emphasize personal accountability and process improvement. Clients work with me to facilitate professional assessment tools, including Strengths Finder™, for the creation of customized small group and individual training needs, and to design qualitative market research programs that support better understanding of your customer or employee needs. Now for the usual bio stuff. I hold a B.S. 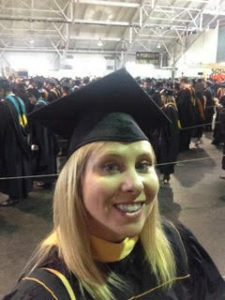 in Agricultural Communications from the University of Illinois and in 2016 I earned an M.S. in Strategic Communication from Purdue University. As an entrepreneur, I didn’t have to go ‘back to school’, I wanted to! I love learning and curiosity about how professionals think, what hold them back, and what propels them forward is part of what (I hope) makes me effective for clients. I was raised in Illinois on a grain and livestock farm. My farming heritage is at the core of who I am and when you hear me present, you’ll notice I often reference the many things I learned from spending time with my farming grandparents. I started my career in agricultural chemical sales with Novartis (now Syngenta) and quickly moved into business development, strategic planning, and sales training with food and agriculture consulting firm, ABG, Inc. (now Adyana). I even had a brief career in financial advising with Robert W. Baird, Inc. Entrepreneurial at heart, I left my last ‘job’ and at 26 launched a retail meat business and at 30 a grant writing firm. I have since sold both businesses. As the former CEO of Prosperity Ag, LLC, I wrote over 300 successful grants in 39 states, yielding nearly $100 million in funding. I am Adjunct Faculty at Indiana University-Purdue University Indianapolis (IUPUI) and have designed and taught curriculum for graduate courses on entrepreneurship. The Indianapolis Business Journal (IBJ) named me to 2013’s 40 Under 40 list of young professionals to watch and in 2015 I was honored as a member of Vance Publishing’s 40 under 40 in Agriculture. After fulfilling my commitment to the new owners Prosperity Ag, LLC (the grant writing business), I knew that it was time to launch a practice that centered on developing people. 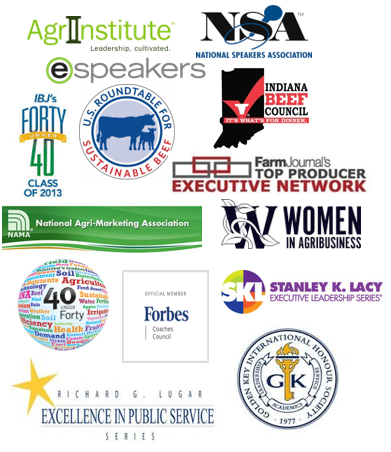 A partial list of clients from recent years includes: Farm Journal Media/Top Producer Executive Network, American Feed Industry Association, Bayer Crop Science, Beck Ag, the National Sorghum Association, CornPro Trailers, Indiana Farm Bureau, the State of Indiana, Brock Grain Handling, Purdue University, Vectren, Virginia’s Ag Region 2000, NTCA The Rural Broadband Association, and numerous cooperative and family business boards of directors. 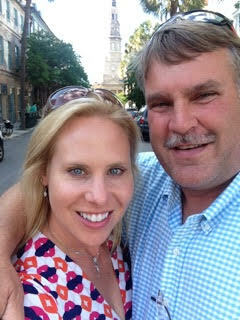 My husband, Cary, and I live in Central Indiana and raise beef cattle. 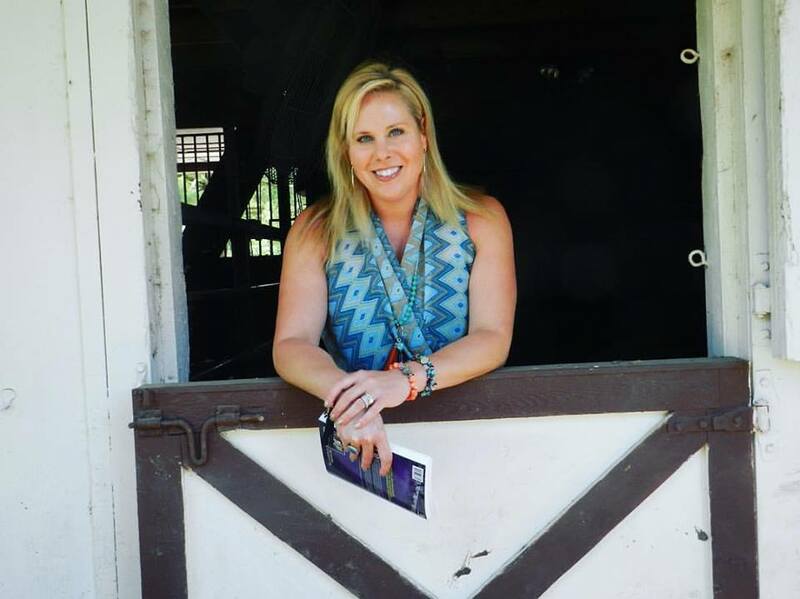 My office is on the farm and since I travel frequently, I often meet clients, hold training sessions and do private executive coaching intensive days in nearby Indianapolis at the business club, Skyline Club. We both love being with friends, sipping good wine, leisure travel, and supporting agriculture through volunteering and board service.